I am going to post everything related to programming and software engineering on my new software engineering blog The Java Logger. See you on the other blog! I just finished creating all of the mockups that I think will be necessary for the Language Learners system. The Mockups page on the Google Code project website has all of them. Feel free to leave a comment or question there or at the end of this blog post. My plan right now is to check out the Hobo framework and, at the same time, read Agile Web Development with Rails by Ruby, Thomas, and Hansson. I am starting to learn all about Ruby on Rails, so I want to use a framework that is easy enough for a beginner like myself to use, and Hobo seems like a good tool to start with; then from there, I could perhaps move on to something else that is more challenging or flexible, or just stick to it if it has everything I need for development. I will give my thoughts on Hobo once I'm done taking it out for a test drive. Today, I finished tidying up the Language Learners project website on Google Code. You can now find a description of the project, one wiki page for the project, and the project's current status on there. I like the layout of the main page. Unfortunately, all of the other pages I've been mocking up do not have this design; they need to be redone. I will post mockups of those pages once they are finished. Spring Break is next week. My plan is to finish mocking up the pages that do not have the same layout as the main page. I also need to create several more mockups of new pages, e.g. one for editing a user's profile and another for allowing a user to upload content to the system (like audio and video files). Regarding video files, my plan is to host them on YouTube and just embed them within the system, like how I do it on my other blog. As for audio files, I may just have to store them on the server on which the system resides. The main page is more or less done, but if you have any feedback with regards to how it looks, what I should add to or remove from it, etc., please let me know. Again, this system will be used to help students learn a new language (including those who are already learning it and just need another way to help them learn the material), which is the reason why I am including content such as on-screen flash cards, and audio and video files. There will also be a forum so that students can exchange ideas with each other. If things work out well, I may also include an instant messaging feature similar to MSN Messenger and AIM. I have decided that for my master's capstone project, I will be developing a web application similar to Livemocha. My adviser will be Dr. Scott Robertson of the Information and Computer Sciences Department at the University of Hawaii at Manoa. I will start working on this project next semester. 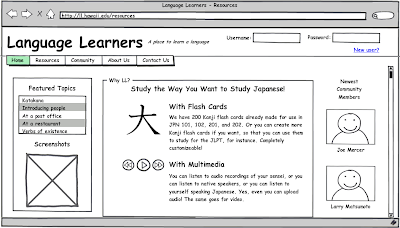 However, in April, I plan on talking to Dr. Robertson about some initial concepts for this web application, which for now is known as Language Learners. I have another blog, called The Traveling Computer Scientist, that you can check out; I will be posting information relating to this project on both blogs (I go by the pen name Joe Mercer on that one, and the other blog I have will be less technical and more for the lay person than this one). Stay tuned, and I will keep you updated with the progress of this new and exciting project that I am about to undertake!